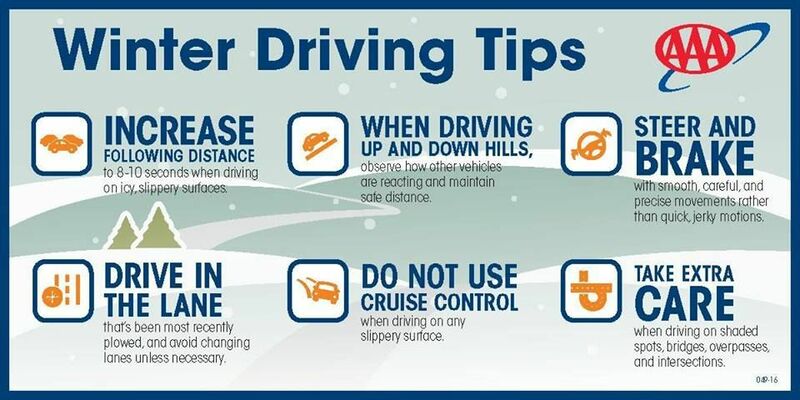 As we wake up to a wintry mix Friday morning, AAA is urging motorists to be especially careful on their commute and throughout the day, as snow is expected to continue throughout the day. AAA is also advising drivers that this is a good time for a seasonal checkup of key vehicle systems in advance of the cold weather and winter driving conditions to minimize breakdowns. Harsh winter conditions make a vehicle work harder, particularly the charging and starting system, headlights, tires and windshield wipers. AAA’s emergency roadside service is prepared for tomorrow’s weather, as AAA crews anticipate aiding members for dead batteries, flat tires, and with tows. Battery: Clean any corrosion from battery posts and cable connections and wash all surfaces with battery terminal cleaner or a solution of baking soda and water. Have the battery checked by a professional to ensure it is strong enough to face cold weather. Tires: Examine tires for tread depth, uneven wearing and cupping. Check tire pressures once a month when tires are cold, and before driving for any distance. In extreme climates, a set of snow tires in some climates may be a wise investment for winter driving safety. Engine: Have any engine drivability problems corrected at a good repair shop. Symptoms like hard starts, rough idling, stalling or diminished power could signal a problem that would be exacerbated by cold weather. Engine hoses and belts should be inspected for wear or cracking. Brakes: Inspect brakes as recommended in your owner’s manual, or sooner if you notice pulsations, pulling, noises while braking or longer stopping distance. Correct minor brake problems promptly. Wipers: Replace worn windshield-wiper blades. If driving in harsh climates, purchase one-piece beam-type or rubber-clad “winter” blades to fight snow and ice build-up. Use cold-weather windshield washer solvent that won’t freeze, and carry an ice-scraper and snow brush. Lights: Inspect all lights and bulbs and replace burned out bulbs. Clean road grime or clouding from all lenses. Hazardous storms and inclement weather are a factor in more than half a million crashes and more than 2,000 road deaths every winter, according to research from the AAA Foundation for Traffic Safety. AAA is encouraging drivers to be prepared and offers the below tips. Avoid using cruise control so you have a better feel for the traction of the tires. If you find yourself in a skid…. look and steer in the direction you want the car to go.